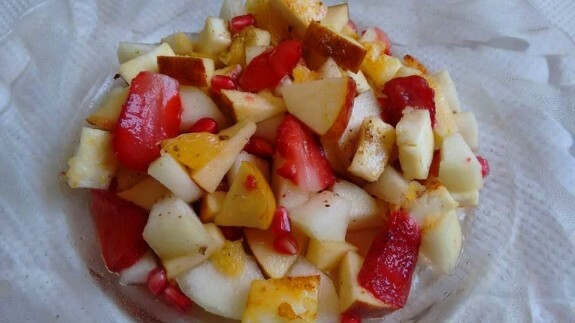 Find out delicious and easy to prepare fruits salad recipes from Masala Route which will transfer your flat chopping fruits into magical fruits salad by tossing with some simple tricks. 1. Heat ghee in a pan and light fry the paneer or cottage cheese cubes. Keep it aside. If you want you can roast the paneer cubes in a plain tawa without ghee. But to make the salad tasty, it is suggested to light fry the paneer cubes in ghee. 2. Now take a large bowl and add all the diced fruits, pomegranates and fried paneer cubes. Mix everything well. 3. Now sprinkle Chaat masala powder and salt (if you wish) and mix it well. 4. Add 1 -2 Tbsp honey (depends on how miuch sweet you want) and mix it with everything. 5. Serve it in a plate immediately. Note: The Paneer Fruits salad will be tastier if you keep the fruits in a fridge for at least 1 hour before making the salad.